The 'First Hotel in Scotland', just over the border, Greens at Gretna is a contemporary hotel, with modern bar and lounge space, design to offer both space and quiet, intimate corners for couples and smaller parties. Greens at Gretna is home to the beautiful Water Gardens which you can choose for your special wedding day ceremony. 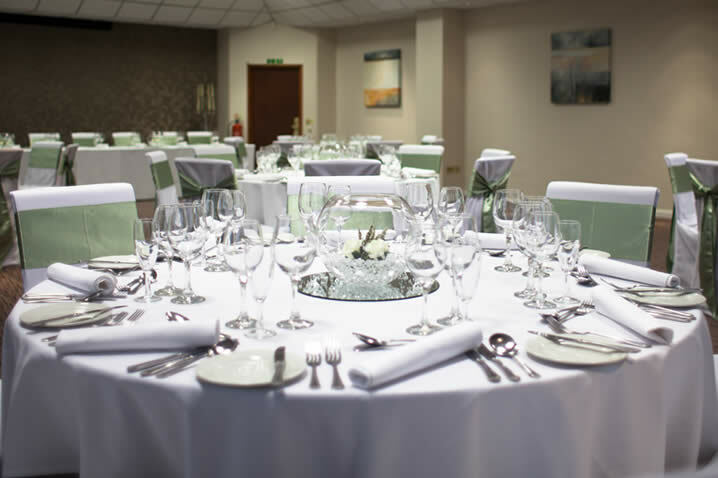 Greens at Gretna hotel is able to host all sizes of Gretna Weddings, wedding receptions and private functions. It has 38 bedrooms, 2 private function rooms and privacy alcoves within the restaurant; and our banqueting space can accommodate small intimate parties from 2 up to a grand event of 90 guests. Here at Greens at Gretna, we can offer you two banqueting suites where your guests will enjoy a choice of warming, traditional dishes from our hot carvery. Our restaurant also boasts privacy booths for smaller intimate wedding parties. The Water Gardens, with views over the Solway Firth, offer an outstanding location for your wedding ceremony and provide the perfect backdrop for your wedding photography. As a price guide, our wedding breakfast packages range from Our Bronze Menu with coffee at $39.00 to our Silver Menu with Carvery at $44.20, or our Gold Menu at $46.80. Our wedding team can discuss your menu preferences with you, in more detail. Our bar serves a selection of popular wedding drinks for you to choose from. Our Drinks Package starts at $16.90 with the option to make a bespoke package to suit your party's needs. We have a Cocktail Wedding Buffet choices start at $16.90 or a lighter option of Bacon Baps or Sausage Baps served with chips at $11.70. For parties of 15 or less, you may wish to be seated in our restaurant and choose from Greens at Gretna Menu.